Augusto “Tanquinho” Mendes got his black belt in December of 2004, by Grand Master Francisco Mansor. He has been teaching Jiu-Jitsu over 19 years, always being recognized as a great instructor, teaching and helping more than 500 students in all those years. Also, he is one of the highest competitive black belts in Jiu-Jitsu. He achieved all the major BJJ titles as a black belt rank in the IBJJF (International Brazilian Jiu-Jitsu Federation). 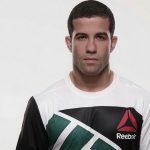 He is current fighting MMA in the UFC on the bantamweight division.